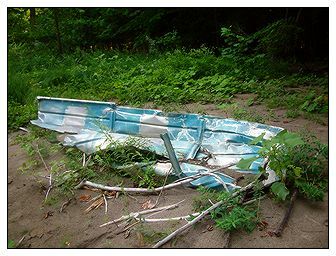 Located on the Main Branch of the Cattaraugus Creek, blue Boat Beach is the beach that has a blue aluminum boat on it. 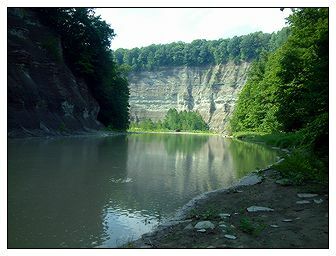 It is a the creek from the highest cliff in Zoar Valley - Giant Fluted Cliff at 415 feet high. To find Blue Boat Beach: Park at Forty Road or Valentines Flats Road. Find your way to the Confluence of the South Branch and the Main Branch of the Cattaraugus Creek. Hike upstream on the main branch. Passing a terrace on the right. Keep going upstream to the next terrace. 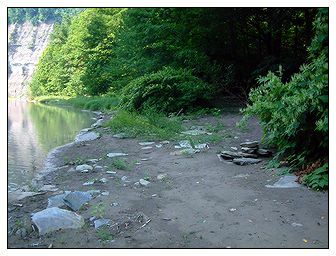 It will be on the left hand side of the creek as you hike upstream. You can also access it by parking in a State Game Lands parking lot at the end of Vail Road and finding the ridge, hiking downstream and climbing down "Hogsback Ridge" to the terrace Blue Boat Beach is on. This trip may be the shortest hike, BUT way more adventuresome.